2 monsters If a card(s) you control would be destroyed by battle or card effect, you can destroy 1 of your monsters this card points to, instead. The Mega Tins just dropped very recently and we got 5 brand new promos for the TCG, and this week we will review them all. We start off this week with the best of the new promos, as it will be an Extra Deck staple in early Link Era, Proxy Dragon. Proxy Dragon is a Link-2 that requires 2 Monsters, so you can use Tokens and Normal Monsters. Gofu will be great with this to upgrade into Decode Talker. Proxy Dragon points Left and Right, which I have said before that these are great Link Markers if you summon this in the Main Monster Zone. If a card(s) you control would be destroyed, you can destroy a monster that this card points to instead. Neat little protection effect to maybe get rid of an XYZ monster who used all of its Overlay Units to protect another important monster or your whole board, and you can summon something else from the Extra Deck. The biggest downside of this card is its 1400 ATK stat, but beggars cannot be choosers. Early on, this card will be staple, but I can see it getting powercreeped later into the Link Era. 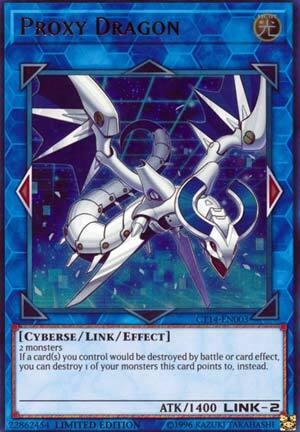 We’re starting the week off with Proxy Dragon, a link 2 light Cyberse with 1400 attack and left/right markers. Proxy can be summoned with any two monsters. So, what does it do? If a card you control would be destroyed, you can destroy something it points to instead. It’s simple, yet elegant and it’s no wonder Proxy is seeing a lot of play at the moment. Granted it’s only to be used as a stepping stone for larger link monsters as it’s a generic Link monster that can summon off a scapegoat from the opponent’s end phase. Proxy has other uses, sure, but they haven’t been taken advantage of yet. He’s perfect for opening up main monster zone slots for extra deck summons and facilitating Link 3/4 plays. Advanced 3.5/5 He looks like Firewall Dragon’s little sibling.